It’s no secret that ‘paddock to plate’ is kind of a big deal right now. We’re all getting in touch with our foodie side, so being able to visit the farms our food comes from means we know that our produce is ethically and sustainably raised, we know it hasn’t sat in cold storage for months and we can reduce our food miles. Also, baby farm animals are hella cute. So where in our little corner of Queensland can we come face to face with the farmers that fill our tables with local goodies? We pretend we visit this beautiful farm of Hinterland Feijoas for the organic fruit, but we’ll be honest, it’s mostly an excuse to pet the mini-goats and binge on homemade cakes and organic tea from Myrtle, the onsite retro caravan café. And in case you haven’t been introduced to feijoas yet, you need to do it stat! They’re high in Vitamin C and fibre and they make an epic smoothie. Of all the ‘pick your own’ fruit experiences, we guarantee you will get your money’s worth with strawberries at Eumundi Strawberry Farm. Supermarket strawbs are usually picked underripe for easier transportation and refrigeration seems to take a way a bit of the amazing fragrance. There’s really nothing quite like the taste of a sweet Eumundi strawberry, still warm from the sun. And picking them from a farm on Strawberry Lane just makes it a bit more magical. Can you even deal with the awesomeness of sunflower field selfies just a couple of hours from the Sunshine Coast? 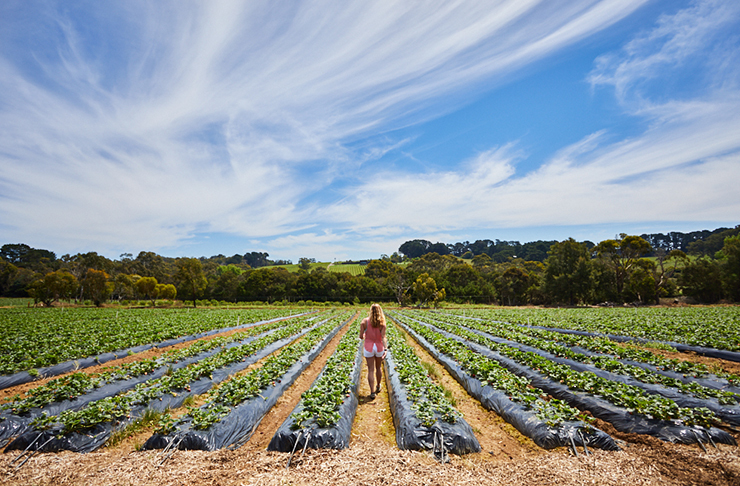 No need to go to Provence, just head to Farm & Co at Kingscliff to stock up on organic produce, learn a bit at a farm tour and top it all off with the perfect Insta backdrop. And if you want to make a mini-break of it, they even have a pet-friendly house available for rent. If you’re as over the parking issues and queues at Noosa Farmers Market as we are, then you might be suffering from a bit of withdrawal from your regular fix of Noosa Reds. Grown in Doonan, these tomatoes are famous for their intense flavor and colour, being picked only when they’re properly ripe. This might not be the spot to bring your newly converted, evangelical vegan mate, but if you’re into ethically produced meat, from happy, healthy animals, then make tracks for Conondale's Baranbali Farm. The family that runs this certified organic farm rears rare breed livestock such as Wessex Saddleback pigs, and all the organic produce is available at the farm store. You can also pick up nitrate-free, wood smoked ham and bacon, and grassfed beef and lamb that have lived a pretty happy life in this little haven. OMG alpaca-feeding. This is not a drill, people. I repeat, this is NOT a drill. You can feed alpacas only minutes from the Sunshine Coast! Their names are Latte and Cappuccino (of course!) and the good folks at Honeybee Farm Country Accommodation will introduce you and even supply the alpaca snacks. The accommodation is slick and stylish—no chintzy floral curtains here, and you can brush up on your apiary skills by attending a beekeeping workshop. Or, if you’re too busy making friends with alpacas, you can just buy some local honey to take home. If you’re keen on producing your own fruit and veg, you can’t miss a visit to Van Veen Organics. Just on your way to Brissie, only a quick turn off from the Bruce, you will find a literal garden of native, tropical and edible plants, with all the expertise and advice you need to actually end up with something edible in return for all your hard work. These guys are genuinely passionate about what they do, and their workshops and education events will have you harvesting the goods from your own food forest in no time. You can’t live on the Sunshine Coast and NOT know about Maleny Dairies. The regular farm tours give you a rare opportunity to see a working dairy and get up close with Guernseys—the Angelina Jolies of the bovine world. You can hand feed calves, check out the milking and even head out for a tractor ride. 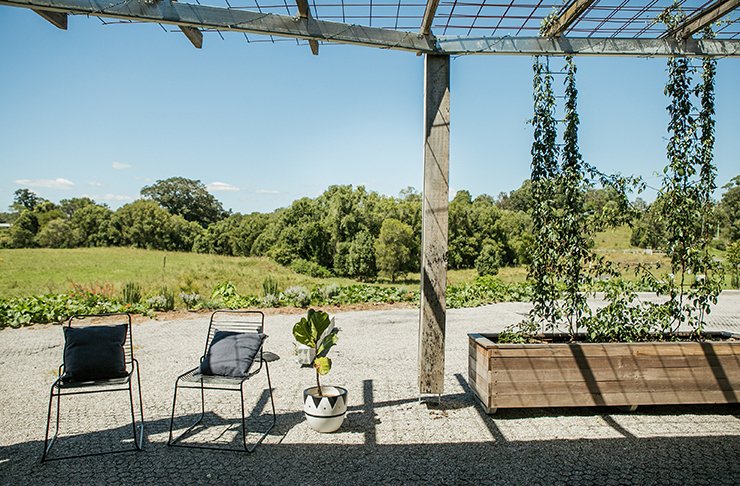 If sustainable and regenerative agriculture sounds like your bag, baby, then this working sheep and cattle farm in the Mary Valley is definitely worth a visit. The Farm Store and Café will be opening in August, selling local produce, home grown and home cooked treats, all with a view over Mary Valley. And we’ve got it on good authority that guided farm tours will be kicking off in Spring. Check out the website for current info on opening dates. They've also opened their own amazing cafe called Kandanga Kitchen, and we're in love! On the search for more things to do on the Sunshine Coast? We've got some epic hikes in our very own backyards. We also round up the 50 Best Things To Do On The Sunshine Coast.